Calgary, Alberta--(Newsfile Corp. - October 22, 2018) - Margaux Resources Ltd. (TSXV: MRL) (OTCQB: MARFF) ("Margaux" or the "Company") is pleased to announce that results have been received for the 12 hole (2,628 m) drill program recently completed on the Bayonne gold property, part of the Company's Sheep Creek Gold District in southern B.C. Based on these results, a drill has been mobilized to the property for follow-up drilling. "Our 2018 drill program showed that the Bayonne property can host lower grade, bulk tonnage style mineralization in addition to discrete high-grade gold veins. We are encouraged with the results to date. The combination of these two styles of mineralization makes this a very strong target," stated Margaux's President and CEO, Tyler Rice. 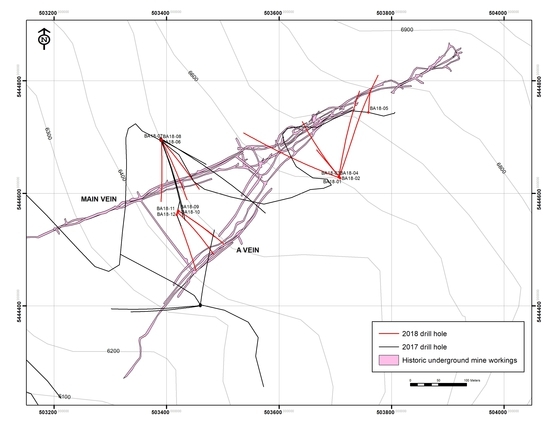 The Company's 2017 drill program confirmed that the Main and A veins, and high-grade gold values, continue at depth below the historic Bayonne mine workings, with results including 1.85 m at 15.31 g/t Au and 1.0 m at 12.7 g/t Au (see Margaux news release November 28, 2017). As shown in the figure below, the 2018 drill program included step-out drilling to follow-up on these areas, as well as exploration drilling in the eastern portion of the vein system, which was untested by any previous drilling. Detailed results from the recent drill program are tabulated below. "In orogenic vein systems, gold mineralization is concentrated in shoots within the vein system. Our 2018 drill program has identified one such shoot in the Bayonne system. We are excited to remobilize the drill rig to the property, to explore this shoot with further drilling and particularly to attempt to trace the mineralization to depth, where gold grades appear to be increasing," stated Linda Caron, VP Exploration for Margaux Resources. Hole BA18-03 intersected a wide zone of strong carbonate-sericite altered granodiorite with multiple narrow, mineralized quartz veins. A 12.22 m interval through the zone of alteration and veining graded 2.89 g/t Au, 20.5 g/t Ag, 1.04% Pb and 0.55% Zn, as shown in the table below. This represents the first time that low-grade, bulk-tonnage style gold mineralization has been intersected on the property and represents a quality target for follow-up testing. Linda Caron, M.Sc., P.Eng, Margaux's Vice President of Exploration, is the Company's Qualified Person as defined by NI 43-101 who has reviewed and approved the technical information contained within this press release. This press release may contain forward looking statements including those describing Margaux's future plans and the expectations of management that a stated result or condition will occur. Any statement addressing future events or conditions necessarily involves inherent risk and uncertainty. Actual results can differ materially from those anticipated by management at the time of writing due to many factors, the majority of which are beyond the control of Margaux and its management. In particular, this news release contains forward-looking statements pertaining, directly or indirectly, to the following: Margaux's exploration plans and work commitments, the potential of mineral resources and potential for recovery thereof, the timing of reporting exploration results, as well as other market conditions and economic factors, business and operations strategies. Readers are cautioned that the foregoing list of risk factors should not be construed as exhaustive. These statements speak only as of the date of this release or as of the date specified in the documents accompanying this release, as the case may be. The Company undertakes no obligation to publicly update or revise any forward-looking statements except as expressly required by applicable securities laws.